1. Rechargeable led propellers for dji mavic air. 2. The LED flash propeller have 5 colors: red, yellow, blue, green and white.It just like a UFO as Mysterious and so cool when you use your Mavic or Platinum flying. 3. The LED flash propeller is charged via USB,which will allow to connect to most of mobile chargers, car chargers or computer.When charging, the indicator light on the LED word propeller will be on. With the increasing of the capacity, the indicator light will become dim gradually. 4.The crash accident of the drone may damage the LED light(s). If it is not light, please change the propeller. 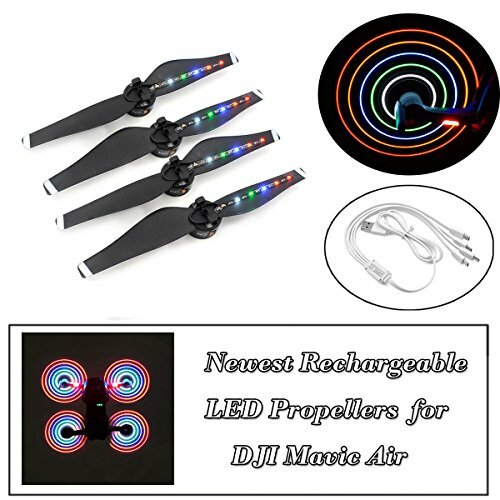 STARTRC LED Propellers design for DJI Mavic Air Drone Night Flying Blades. Mavic air led blades have 5 colors,Mavic air flying in the sky just like a Black holes in space,it's colorful black holes in the earth. LED propellers, you can use it by outdoors,party, park,riding, extreme sport etc. scene,it will made you become protagonist among all people, Object of lover. Mavic air propellers have inlclude a 4in 1 USB port charge cable,it not only charger all of 4 led propellers,but aslo charger all of Micro USB port charging products. Now led props VS Old led propeller: The newest mavic air led propeller the led strap,the balance,the noise,the switch, all of this better more than old mavic air led propellers .